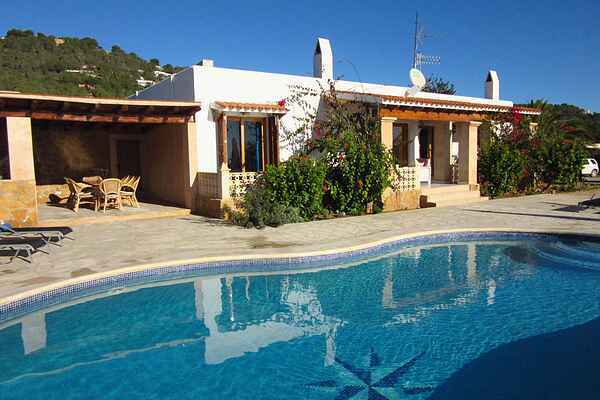 The villa is located 1.5 km from the village Es Cubells, south east of Ibiza, and offers a stunning view across land, sea, and the island of Formentera. From the beach of Cala d'Hort (3 km) you can see the desert island and nature reserve Es Vedra. The villa has a cozy living room with fireplace and a fully equipped kitchen with a dining table for 6 people. From the kitchen, you have access to the covered terrace. The bedrooms have air conditioning, and are all on one level, just like the bathrooms. In front of the house, lies a wonderful private pool. There is a second covered terrace beside the pool with a fixed barbecue. There is plenty of room for the children to play around the house. You have plenty of privacy here. Es Cubells is one of the smallest villages on the island, with only one church and two bars in the center. There is also a library from whichyou have the most beautiful view of the sea. The charming village lies at the edge of an immense cliff, with several fishing bays below. Formentera is the smallest inhabited island of the Balearics. It lies circa 7 km south of Ibiza and is 19 km long. The island can only be reached by boat.